With only a handful of feature films under his belt as director – DILLINGER (1973), BIG WEDNESDAY (1978), CONAN THE BARBARIAN (1982) and RED DAWN (1984) being the most well-known among them – it may seem odd that there is such a rowdy cult around the name of John Milius. But Milius’ place in film history is only partially indebted to the reputations of those films where he donned the director’s hat. Most people think of APOCALYPSE NOW as Coppola’s film, of JAWS as Spielberg’s. But ask people what they remember most about those films, and certainly for one it’s lines like “I love the smell of napalm in the morning” and “Charlie Don’t Surf!”, and in the other, Robert Shaw’s harrowing retelling of the tragedy of the SS Indianapolis. Add to this the immortal quip, “You feel lucky, punk?” from Don Siegel’s inaugural DIRTY HARRY film (or even “Go ahead, make my day” – which he allegedly/apocryphally wrote uncredited for its sequel SUDDEN IMPACT in 1983 )- and it’s easy to see why Milius was one of the most respected screenwriters in Hollywood, even before he ever stepped behind the camera . Zak Knutson and Joey Figueroa’s 2013 documentary MILIUS, which I caught at the Sitges Film Festival in Spain (following a world premiere at SXSW earlier this year), manages to put together a surprising cast of often-inaccessible A-listers to chronicle the bombastic history of this legendary storyteller. This cult of masculinity, with an emphasis on personal honour codes and loyalty among friends would become a hallmark of Milius’ films, both as writer and director. 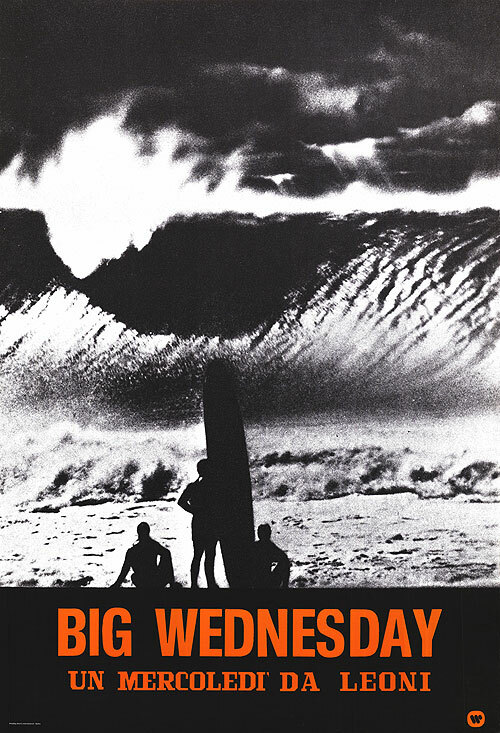 But his take on masculinity was not limited to the battlefield or other types of violent crisis, as his third and most personal feature BIG WEDNESDAY shows quite beautifully. A more lackadaisical type of bromance forms the heart of this coming of age surfer’s tale in which the Vietnam War is a component of the story, but not the center of action (I was pleased to learn at Sitges that BIG WEDNESDAY is one of director Richard Stanley’s few “comfort” movies, the latter being an artist also known for going headfirst into the fire). So, back to the Sam Elliott quote that opens this article: if Milius doesn’t write for women – what do I get out of them? Frankly, I’ve always related to the stereotypical ideals of masculinity much more than their feminine counterparts. I’m a huge fan of the 70s “man movies” that came in the wake of second-wave feminism: ELECTRAGLIDE IN BLUE, COCKFIGHTER, CISCO PIKE, FREEBIE AND THE BEAN, THE MECHANIC, THE SEVEN-UPS, BRING ME THE HEAD OF ALFREDO GARCIA, the list goes on. I find the somewhat mythical onscreen relationships between men to be inherently more appealing than the sisterhood of travelling pants we’re given as an alternative. What is best in life? Is it to have “the wind beneath your wings”, or to “crush your enemies, see them driven before you, and to hear the lamentation of their women”? Of course, we’re not limited to movies made “for men” and movies made “for women”, but having to pick between the two, I’ll always go for the machismo. This comes down to the fact that masculine ideals have an inherent extremity to them that is often funny to me. I don’t want to live in a male-dominated society, or a conservative society, but I sure love watching them played out onscreen! I just respond to extremes in my fiction. As in the Ezra Pound quote cited at the beginning of Charles Willeford’s COCKFIGHTER (1962, later to be adapted into the Monte Hellman film): “What matters is not the idea a man holds, but the depth at which he holds it.” John Milius is an artist who takes this sentiment to heart. The doc starts out exceptionally strong, with interviewees each recounting crazy stories and trotting out famous offscreen Milius quotes that combine to make the film raucous from the first frame. 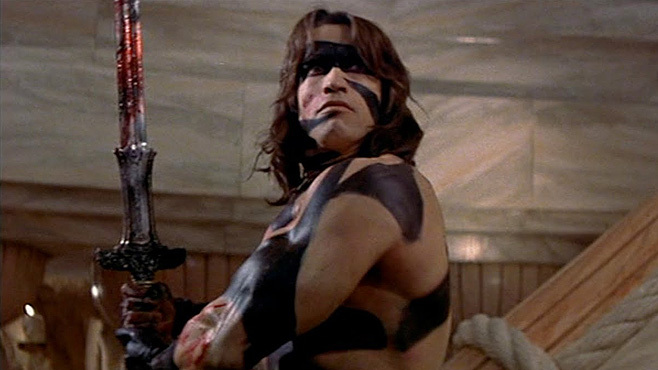 Unfortunately as it gets bogged down in a film-by-film case study, it inevitably sputters and fizzles out towards the end, as Milius goes into a long period of inactivity followed by the tragic stroke that precluded the long-anticipated CONAN sequel, KING CONAN. 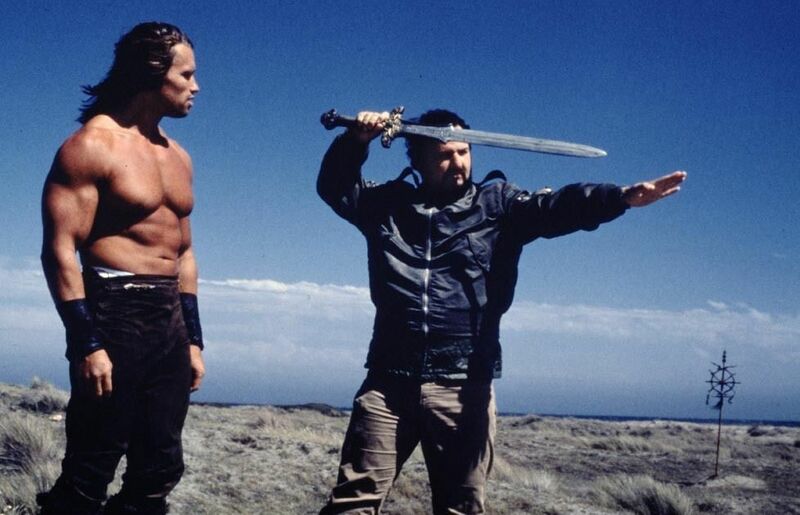 One area sadly unexplored was the relationship between Milius and his departed longtime composer Basil Poledouris, a fellow USC Film alum and perhaps his closest partner in creating the epic, honour-driven vision we associate with Milius’ work. As the film comes to a close, Milius’ plans for a GENGHIS KHAN historical epic are laid out, complete with slightly animated storyboards. Interviewees offer up their last succinct commendations, which by this point just start to seem repetitive and forced. But the impact of Milius’ work even outside of the film industry can’t be denied: not only did Reagan use the phrase “Go ahead – make my day” in a 1985 speech, but somewhat chillingly, the capture and arrest of Iraqi president Saddam Hussein was called “Operation Red Dawn” and a duo of its military sites labelled “Wolverine 1” and “Wolverine 2” (admittedly it was kind of a bummer move to run this dehumanizing news footage beneath the end credits). It seems that republican officials even aside from the Gubernator have proudly seized Milius as one of their own. 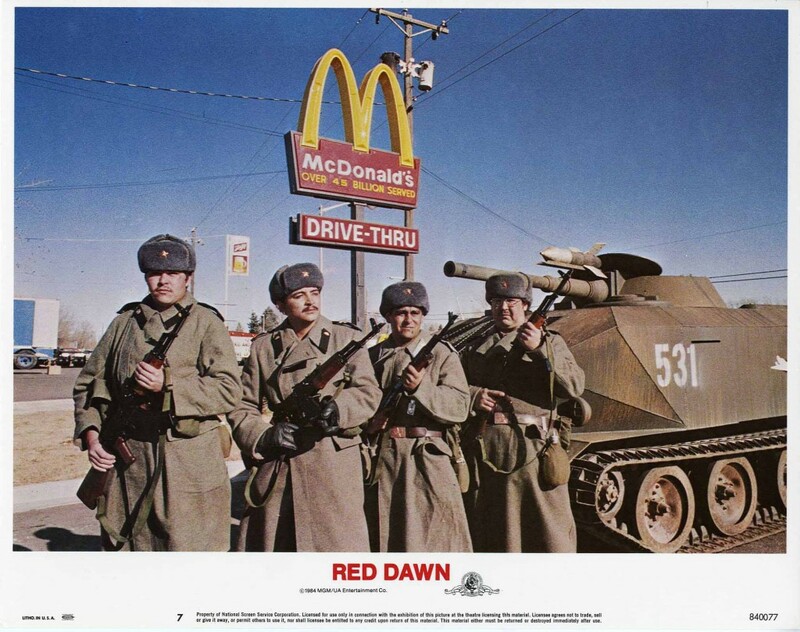 Where this becomes problematic is in that I’ve always felt Milius’ films to be fiercely aligned with the individual, not just propagandizing faceless, brutal patriotism. 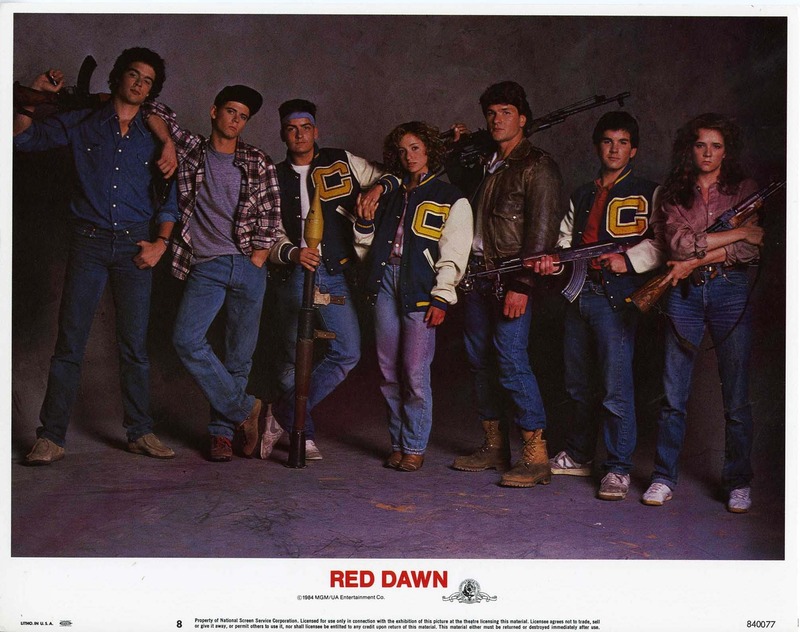 Would Milius be proud that terminology from his 1984 anti-commie brat pack film has been adopted into the military lexicon? Maybe. Probably. But that would be a disappointment. 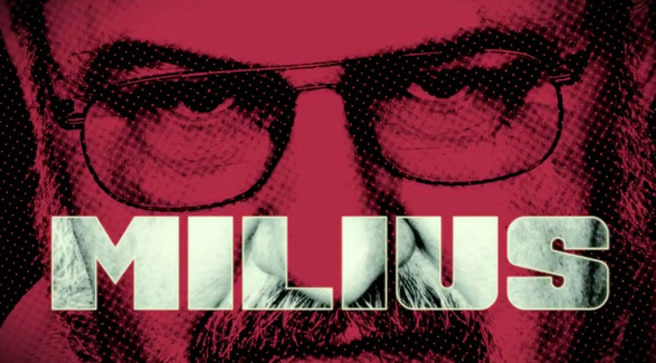 Luckily the documentary – while providing an ample anecdotal history of Milius as a filmmaker and eccentric character – leaves enough room for critical questions to steep. 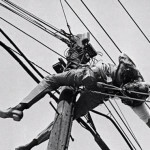 What kinds of ethical and moral issues arise when you try to live your life like it’s a movie? John Milius may be one of our most apt surviving examples through which to navigate this question, and Zak Knutson and Joey Figueroa’s doc is a good place to start. That Milius wrote this quote remains a point of contention. The documentary as well as anecdotal sources imply that he did, but most official sources credit the film’s screenwriter Charles B. Pierce (also director of THE TOWN THAT DREADED SUNDOWN and THE LEGEND OF BOGGY CREEK). To further confuse the issue of credit, the same line appears a year earlier in Gary Sherman’s sleazoid masterpiece VICE SQUAD (1982). He did direct several short films while in school at USC, but I am referring here to features. New book: COCKFIGHT now funding on Indiegogo!